A New York physician has been arrested on charges of illegally selling painkiller prescriptions to two patients. Ney York’s Attorney General Eric Schneiderman said Dr. Anand Persaud was arrested at his Baldwin, Long Island, office, on Tuesday. He was arraigned in Nassau County Court on two counts of criminal sale of a controlled substance, NBC reported. The New York Daily News reported that Persaud, who faces up to 15 years in prison if convicted, pleaded not guilty at his arraignment and was ordered held without bail. Authorities say Persaud is the fifth-highest prescriber of painkillers in the state. Persaud, who also has an office in Queens, is accused of selling prescriptions for oxycodone without providing medical documentation or a medical exam. He allegedly charged US$250 or more for each painkiller prescription, and prosecutors said he took in almost US$1.5 million in two years, the report said. “He had hundreds of people who were hooked on prescription pain relievers, and he was dishing it out like candy,” Schneiderman was quoted as saying. The sales allegedly happened in November 2012 and March 2013. The year-long investigation into Persaud began when Rockville Centre police arrested one of his patients. Later, undercover investigators bought prescriptions while posing as patients, said Schneiderman. Oxycodone is one of a number of highly addictive opiates. In a statement, Schneiderman said that the arrest occurred after investigators from the New York State Attorney General’s Medicaid Fraud Control Unit executed a search warrant at Persaud’s medical offices located at 1019 Atlantic Avenue in Baldwin and 173-25 Jamaica Avenue in Queens. Persaud is charged with selling a prescription for oxycodone without providing medical documentation or conducting a medical examination of his patient on both November 13, 2012 and March 19th, 2013. New York State law prohibits physicians from prescribing controlled substances, such as oxycodone, other than in good faith in the course of their professional practice. Oxycodone is one of a number of highly addictive opiates classified as Schedule II-(b) controlled substances. Under New York State Penal Law, Scheduled II-(b) controlled substances are considered narcotic drugs. His attorney, Todd Greenberg told reporters Persaud was a “very respectable doctor and he’s helped a lot of people,” according to NBC. “The charges are shocking, and we’re going to work our way through the criminal court system,” said Greenberg. NBC reported that several New York area physicians have been arrested in the past two years as part of an ongoing crackdown on painkiller abuse. According to Schneider-man’s statement, Persaud maintained a two-tiered practice. He had “medical” patients, those with regular medical issues, who were charged US$110 for an office visit, and “pain management” patients, drug users and addicts, who were charged US$250 or more for an office visit that included a prescription for a controlled substance. 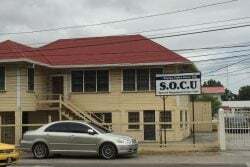 On both dates in question, Persaud charged a patient US$250 or more to receive a prescription for oxycodone. Persaud did not conduct a physical examination of either patient or even question them about their need for the medication. Both patients were Medicaid recipients eligible for no-cost medical care from Persaud who is an enrolled Medicaid provider. By enrolling in the State’s Medicaid programme, a provider agrees to accept payment from Medicaid as payment in full for all care, services and supplies billed under the programme, except where specifically provided in law to the contrary. The patients in question presented themselves to Persaud as Medicaid recipients.